NextNeed help navigating the US immigration process? Filing for a change in immigration status can present many difficulties. Even if you are eligible for obtaining your green card or becoming a U.S. citizen, the process can be extremely confusing. You need to obtain all the right forms and fill them out without making any mistakes or overlooking a requirement. Any error may lead to costly reprocessing fees and delays that might mean you miss out on moving forward this year. Furthermore, hiring an immigration attorney to avoid such problems is often too expensive. Much like tax preparation software, FileRight’s online program helps you to complete complicated forms accurately. Try glancing over official immigration documents and you’re likely to find yourself bewildered by the counterintuitive format and frustrated by bureaucratic jargon. FileRight asks you one question at a time, customized to your specific situation and in either English or Spanish. Along the way, the program defines important terms and explains relevant concepts, so you never have to worry that you misunderstood an item. FileRight provides programs for a wide variety of immigration forms. Whether you need to apply for citizenship, renew a green card, sponsor a relative for permanent residency or apply for deferred action, FileRight will guide you through gathering all the necessary information. If you’re not certain which document you need, take a quiz to find out. Plus, the software is always up-to-date with any changes in immigration paperwork, so you’ll know that you are filling out the current version of the form. If you need more detailed, personalized assistance with using the software, FileRight is happy to help. Technical support is available 24 hours a day, seven days a week. A real, friendly and knowledgeable person will get you on track so you can finish off your paperwork in a timely fashion. Even after you file, the support team will be ready to help you check on your case status and answer any other questions you may have. When you’ve finished, FileRight will double-check your form to ensure you didn’t miss anything. Once you confirm that all items are complete and you have entered all your details accurately, you just have to print. The program will produce a properly formatted, official USCIS document for you to sign and send in by mail. FileRight provides you with thorough instructions for sending in your forms to be filed with with USCIS. Documents prepared using the program include a 2D barcode that allows them to be processed more quickly than if you filled out the documents with pen and paper. Keep in mind, though, that your wait will nonetheless depend upon the benefit you are applying for and other aspects of your immigration status. 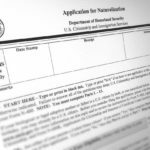 USCIS provides estimates of how long it will take to review an application. When you submit an application using the online software, you can rest assured that FileRight has your back. All your information will be kept confidential and guarded by 256-bit encryption. You also have the security of a double guarantee: FileRight promises complete satisfaction with its product and will refund both your payment and any government fees should your application be rejected. FileRight shows you the way through all the red tape, making it easy to locate the right forms, fill them out and file with the USCIS. Get started today, so you can move forward with your immigration status and your life.